National Phonograph Co. (manufacturers). A wax cylinder record, titled My South Polar Expedition by Lieut. E.H. Shackleton. Orange, New Jersey, U.S.A.: National Phonograph Co., [recorded 30 March 1909]. 105mm. long, 55mm. external diameter. 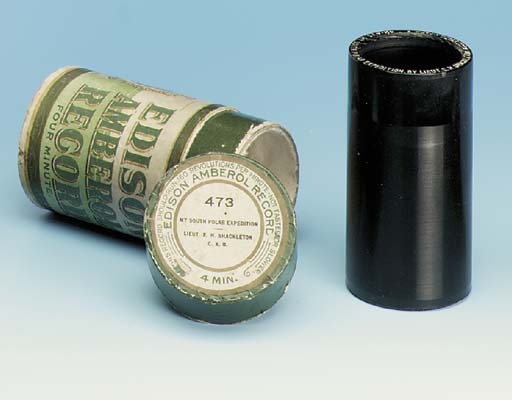 Contained within original paper-covered cardboard tube with cover, titled "Edison Amborol Record". A VERY RARE FOUR MINUTE RECORDING OF SHACKLETON'S VOICE. Recorded in New Zealand, a week after his return to civilisation, he summarises the achievements of the expedition "We reached a point within 97 geographical miles of the South Pole; the only thing that stopped us from reaching the actual point was the lack of 50lbs. of food. Another party reached, for the first time, the South Magnetic Pole; another party reached the summit of a great active volcano, Mount Erebus. We made many interesting geological and scientific discoveries and had many narrow escaped throughout the whole time". He then goes on to describe "A typical narrow escape", the loss of Socks, one of the ponies, in a crevasse.